This is an unabashedly cheese-less pizza, and it is all the more delicious for its absence. The savory richness of the chili-peanut sauce, the fresh and vibrant vegetables, leafy greens, crunchy peanuts and chewy pizza crust will have you craving this combination from the first bite forward! Mix the peanut butter and warmed coconut or plain water together first, dissolving any clumps with a whisk. Add the remaining ingredients and mix well. Stretch out the dough to the size of a large pizza and place upon a pizza pan. Set aside to rest. Sprinkle the tofu with the Chik’Nish and sauté over medium heat until lightly browned. Set aside. Sauté the zucchini, bell pepper and garlic over medium heat until slightly browned. Set aside. 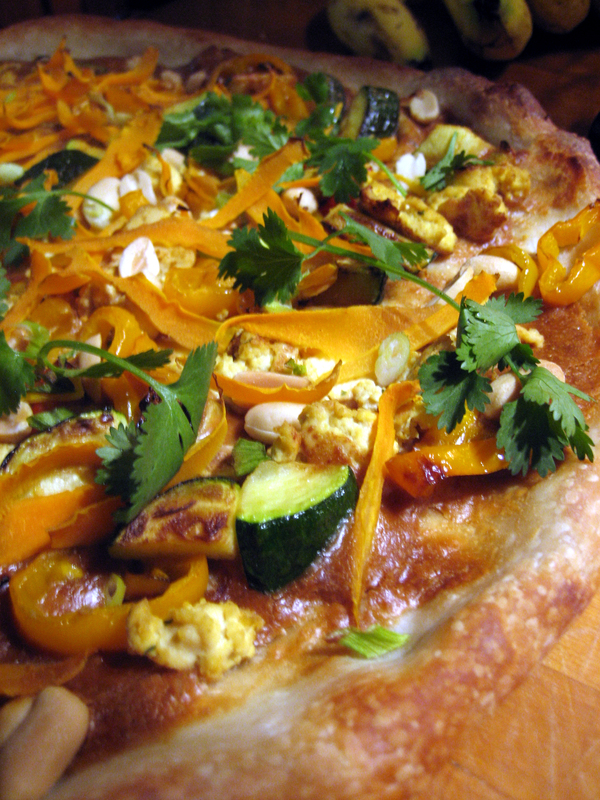 Spoon out a generous amount of the spicy peanut sauce over the pizza dough and disperse evenly. [Remember to save a bit of the sauce to dress the mesclun salad greens.] Next, simply spread out the cooked ingredients: tofu, zucchini, bell pepper and garlic. 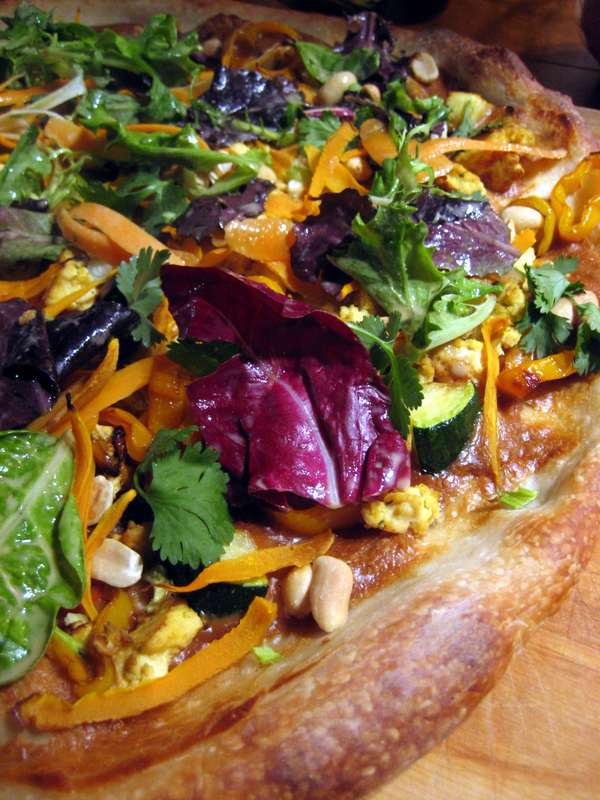 Top with an even layer of carrot strips and peanuts. Bake in the oven until the crust and toppings are browned. Dress the mesclun greens with some of the spicy peanut sauce. Top the pizza with the sliced green onions, cilantro, mung bean sprouts and dressed mesclun. What a pizza! That looks amazing and I’m saving this in my recipe files! YUM! You’re welcome! I actually made this pizza on vacation. We had access to a kitchen with a stove, and I just trucked in all the ingredients and threw it together. It’s a really easy and amazingly delicious pizza. Fair warning though, it will induce cravings for more! Wow! I would have never come up with this creation on my own. It’s looks divine. So fresh! Hey, I just wanted to let you know that the first Midnight Maniac Meatless Mondays is up. This would be a great link to have on it. Just click the above link to come over and add it. Thank you, Sunshine and Susan! I had to get my greens on and figured that the fresh salad greens dressed with the peanut sauce would be killer on top and add a freshness that most pizzas lack. Turns out it kicked it up a few levels not only in beauty but also in texture and flavor. Thanks for sharing this awesome recipe! I’m making it for dinner tonight and I already know it’s going to be delish because the sauce is devine–I love the addition of the coconut water. Happy early Meatless Monday! You might like my MMMM recipe–vegan if you omit the cheese, which I often do since I’m lactose intolerant! You’re very welcome Julie. That sauce is highly addictive! Enjoy, my fellow Meatless Monday kemosabe!